Celebrate the 4th of July in New Orleans! This unique salute to America's independence will feature a fireworks display from two barges over the Mighty Mississippi. The dueling barges display paints beautiful strokes of radiant light with thesky as a canvas and color as the palette. You can also watch the fireworks live on wwl.com! View Shopping Differently! Drop into the monumental Jackson Brewery for a taste of New Orleans history and shopping. Located on the Mississippi River, Jackson Brewery offers two full floors of stores, kiosks, restaurants, bars and cafes. Enjoy breathtaking views of historic New Orleans, and take home more than just memories. 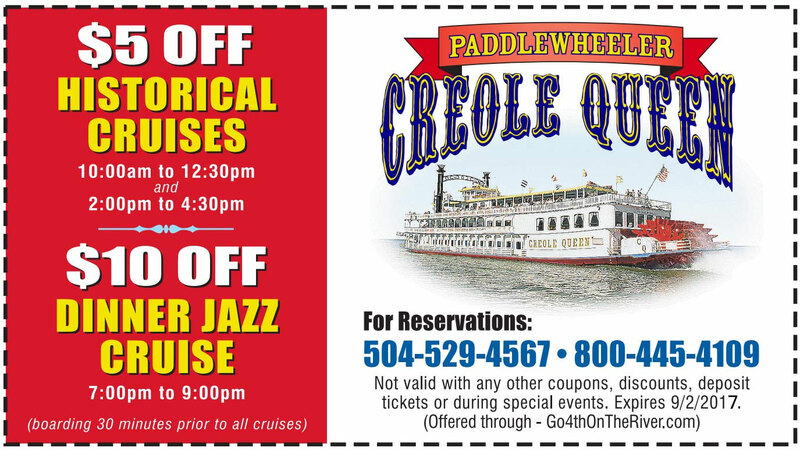 ThePERFECT way to celebrate Independence Day is to join us aboard theauthentic and award winning Paddlewheeler CreoleQueen. Enjoy aBreathtaking View of the Magnificent July 4th Fireworks Show over theMississippi River. July 4th Menu:CelebrationSalad, Baked Beans, BBQ Chicken, Hot Dogs, Beef Brisket, Mama's SmashedPotatoes, Corn Nibblets, Watermelon Wedges, and Paddlewheeler Bread Pudding. This premiere outlet shopping center located on the bank of the Mississippi River opened in May 2014, and features well-known national retailers like Coach Outlet, Neiman Marcus Last Call Studio, Tommy Bahama Outlet, Kenneth Cole Outlet and more. Local favorites, like Cafe du Monde, are also represented, giving an authentic New Orleans shopping experience. Indulge in this vibrant waterfront destination featuring upscale fashions at discounted prices, all in the heart of downtown New Orleans. Drive to New Orleans, park the car and walk to all of the top attractions from Hilton New Orleans Riverside! This parking package gives you the freedom to explore downtown New Orleans on foot or by streetcar without the hassle of finding parking spots. Enjoy walking the city, or ride the historic streetcars to your favorite destinations. Best View in town for the Fireworks Display! Boarding in the heart of the French Quarter begins at 6:30 pm set sail at 7:30 pm, returning after the fireworks display and docking no later than 9:30 p.m. Reservations requested. Enjoy the spectacular fireworks on the Mississippi and then a fun stay overnight at the Westin Canal Place. Click this link for special July 4 rate!